Long handled DE safety razor with a closed comb head and chrome plated finish. Earn up to 29 Reward Points for this item. 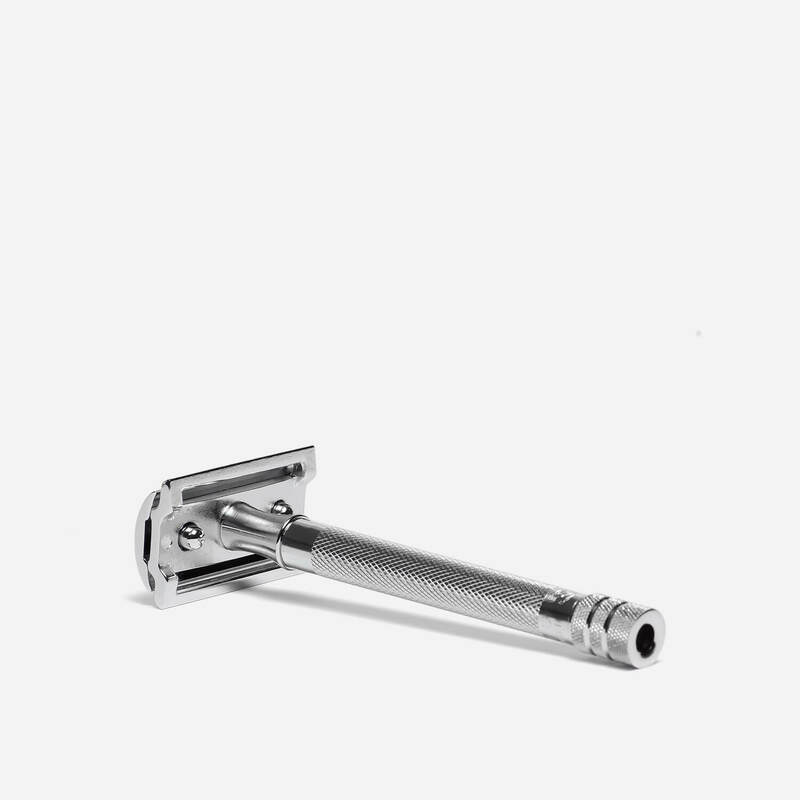 The Merkur 23C is a long handled DE Safety razor with a closed comb head. The razor offers a mild shave, making it the ideal razor if you’re just starting out with DE safety razor shaving. The long handle, 95mm, makes the razor more suited to those with larger hands or if you’re using the razor to shave hard to reach areas, such as the legs. The slim and hollow handle makes the razor lighter than most other DE safety razors (of similar size), at 61g. The longer handle is what drew me to this razor, and it’s definitely appreciated during a shave. Would definitely recommend this razor to others. Great razor, a solid feel and the longer handle makes it much easier to use. Great quality item, gives a lovely shave, very pleased. Took me a while to get used to it but it does give a close shave. My first proper razor and I’m impressed. Nice weight and balance. Recommended. Great for a newbie like myself! Very easy to use. Having used ‘mainstream’ multi-blade razors for many years, this was a perfect step up. A slightly longer handle suited me well & the textured effect gave a more assured feel, the weight was also a nice bonus. Well engineered, I am very happy with this razor. Great product and a nice weight! Prompt delivery. Great. Best shave my husband has ever had. Was as described and came in good time. Nice balance to the razor and a very close and smooth shave. Would highly recommend this shaver. Brilliant razor for a newbie. Takes a bit of getting used to but overall it has been quite good. I bought this for my partner as she liked to use my 34c but found the handle too short. The 23c has a longer, thinner handle and feels much lighter than the 34c. I have returned to safety razor shaving after many years. I did my internet research and decided on this razor, the shorter ones seemed too short. I am pleased with it and the service from Shave Lounge. Well, this beginners choice at least. After many years of disposable ‘face rakers’ the 23c is a welcome change. User friendly, easy to swap out blades and a nice heft to the thing. Goodbye forever twin bladed disposables!